There’s nothing wrong with using Tumblr as a CMS. It’s straight-forward, easy to use and with a little bit of customization – you can easily build a website that packs a punch. WordPress is great but sometimes your project doesn’t need all those bells and whistles. Disqus also easily solves the lack of comments so that you can have interactions between you and your users – instead of going through the reblog culture of it all. Theming is pretty easy. Converting HTML to Tumblr ready code isn’t at all as difficult as it sounds and so there’s this stunning collection of themes floating around. 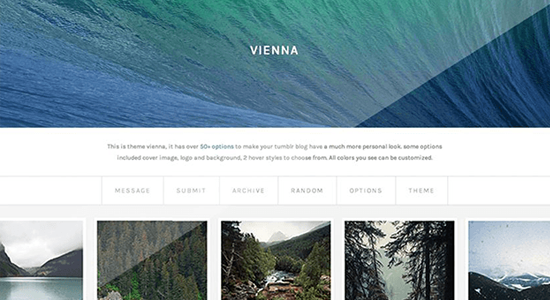 Here are some of my favourite free responsive tumblr themes. A common trend for Tumblr themes is tiny text. Ashley’s focus is readability and typography. This is perfect for blogs who’s focus is content. This is a one-column tumblr theme for minimalists. Two column layout with Social Media support. You can even add your own logo to the side bar. AppBlog is a two-column theme with an extra hidden navigation. The theme has a lot of customization options and has a strong focus on content. Museo is a gorgeous one-column theme that features a pop of colour you can customize. Museo stands as being another very good portfolio theme with grids and a very clean navigation system. You can also customize the background and the colors. Also supports Social Media links. Sleek is another very clean, skinny layout that looks good on any browser and mobile device. It also supports social media and disqus comments. Timbre is an elegant theme with a very classy side bar. The theme is completely fluid and supports social media, disqus and social media comments. Also, perfect for High-Res images. NOTE: Three 404 items were removed. We will update this list soon. Enjoy, Creatives! Like it? Love it? Have a theme we forgot? Let us know in the comments!